Michigan Cranial Reshaping Orthosis - Danmar Cranial - Danmar Products, Inc. The Michigan Cranial Reshaping Orthosis is intended for prescription used to apply pressure to prominent regions of an infant's cranium in order to improve cranial symmetry and/or shape. A mold is made of the baby's head to create the infant's helmet/orthotic. A plaster cast or a lesser-scanning accessory may be used to create a scan of the infant's head to create the mold. The device is indicated for infants from 3 to 18 months of age, with moderate to severe nonsynostotic positional plagiocephaly, including infants with plagiocephalic and brchycephalic shaped heads. The orthosis is generally worn both day and night for an average period of four to six months. During that time, the baby is monitored for any signs of pressure areas and the orthosis will be modified or replaced to accommodate growth as necessary. Cranial reshaping therapy may require more than one orthosis as the baby grows. Each baby is different and has his/her own rate of development, which may affect the length of time that the orthosis is needed. The period of time that a specific size orthosis may be used will vary based on when the therapy begins. The Orthotist will supply all the information on breaking in the orthosis, regular wearing instructions, cleaning and general care. If positional plagiocephaly is associated with torticollis, there may be some additional types of therapy needed as well. If the child is recommended for physical therapy, home neck exercises and/or stretching programs by your doctor, remove the orthosis during therapy and replace it soon after completing these exercises. 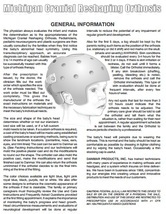 Download a .pdf copy with general information about Michigan Cranial Reshaping Orthosis. We are proud to be partnering with Ohio Willowood Laser Scanning and Carving Software Systems. A digital image is captured of the shape of the infants head using a scanner, then this image is sent to our 3 dimensional carver that creates a duplicate of the shape in foam. This is a time saving step as we can then immediately begin working on the orthosis.